Kinetic makes wearable devices for material handling workers that can significantly reduce lifting related injuries. They produce a wearable device that alerts handling workers when they are at risk for injury when lifting products to be shipped. I created the user experience, visual designs, and a clickable prototype for the software application that provides real-time metrics to senior staff. The application is live and is used by UPS and Caterpillar, amongst others. Kinetic had completed extensive research surrounding the use of the wearable device in the workplace. Research indicated that workers using the device were as motivated, if not more motivated, to improve their lifting habits when a contest involving a prize was involved. This might include a cash bonus for workers showing the most significant improvements. Additionally, research indicated that the senior staff reviewing worker performance was most concerned with 'at a glance' metrics showing which workers had improved the most and deteriorated the most over a select time period. Further, the typical user of the dashboard was not overly tech-savvy, had limited time to review data, and were typically using outdated desktop machines. 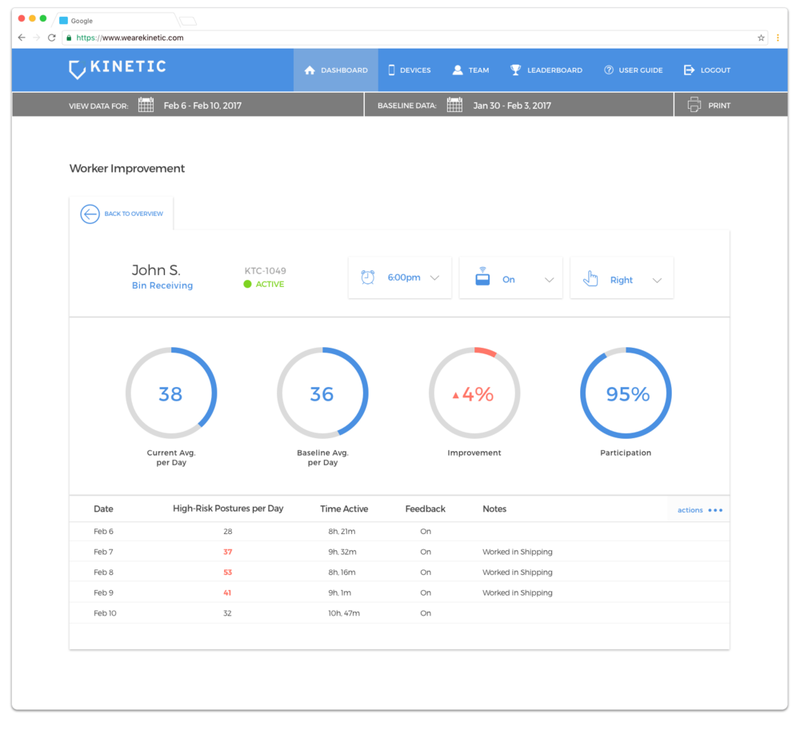 Kinetic provided documentation detailing the specific metrics that needed to be shown. This documentation served as a jump off point for our design. These research insights, in addition to the metrics, led me to focus the design approach on a simple, intuitive Dashboard and Leaderboard interface focused on easily accessible metrics and a constant 'heads up' display of how workers were performing against expectations. Below is a sample of the visual designs created that were implemented into the prototype.